Celebrity Constellation prides itself on delivering a consistently palate-pleasing dining experience. Considering that the galley delivers thousands of tasty meals three times a day to passengers with different culinary traditions and needs, occasional misses are not surprising. The good news is that if something doesn't satisfy, you can simply order something else rather than stew over a tough piece of meat or overcooked eggs. Servers stress this, knowing that everyone from the executive chef on down is determined to make you happy with your food and drink. Most servers guide passengers through the daily menu, suggesting popular items and warning you away from dishes that haven't passed muster with other passengers. We've learned it's wise to heed their advice. Occasionally there are special theme-type parties and dinners celebrating a port or holiday; you'll find them along with the restaurant and drink specials of the day in the ship's daily newsletter. Celebrity Constellation's massive two-deck, 1,170­-seat San Marco dining room features an elegant curving double staircase leading from the upper to the lower dining rooms. Two rows of dark wood columns form a corridor from the stairway to a dramatic two-deck-high wall of windows, which offers views of the ship's trailing wake. For breakfast, served 7:30 a.m. to 8:45 a.m., passengers can sip their coffee while enjoying eggs to order served with potatoes, sausage or bacon, omelets, pancakes, waffles, cereals, pastries and other breakfast favorites. There is no assigned seating for breakfast or lunch. Lunch seating begins at noon and ends at 1:30 p.m. Diners can choose from standard entree items like hamburgers, soups, sandwiches, pastas and salads or choose from specials like shepherd's pie, fried chicken, fish and chips and international dishes including Indian, Chinese and Italian. For dinner, passengers can opt for traditional set seating at 5:45 p.m. (early) or 8:15 p.m. (late), or choose "Select Main Dining," which offers open seating between 5:15 p.m. and 9 p.m. Menus consist of a choice of appetizers, soups and salads, entrees and desserts, and dinner is served over a leisurely two-­plus hours, which give diners time to get to know their new tablemates and share stories about onshore and shipboard adventures. The menu is divided into two sections: one lists items always on the menu -- ranging from escargot and shrimp cocktail to steak and grilled salmon -- while the other lists the day's specials. A fleetwide tradition, a lobster entree is offered on the last formal night. Menus offer a wide range of traditional international dishes from mild (beef Wellington, prime rib, fried chicken or veal chops) to wild (frog's legs, snails and ceviche). For vegetarians, there are several meat-free options like vegetable and ricotta cheese-stuffed "conch" shells and vegetable paella. Low-calorie specialties, like poached salmon, grilled chicken breasts or sugar-free desserts, are marked with a little heart on the menu. Celebrity deserves special commendation for its portion restraint (in the main dining room, at least). The reasonably sized appetizers and salads allow passengers to save room for dessert. It's also perfectly acceptable to order two starters, appetizers or desserts if you're really hungry or just can't make up your mind. All of the dining venues offer their own selection of mostly American and European wines on a list that runs from $25 on up. There are also a few trophy wines like a bottle of Screaming Eagle ($1,000-plus). Sommeliers assigned to each table can be very helpful in selecting wines suited to your palate and pocketbook. If you plan on drinking wine most evenings, one of the wine packages can save you money. Service will save partially consumed wine bottles for your next dinner or lunch. As of now, passengers are no longer limited to bringing only two bottles of wine onboard for consumption during the cruise. Keep in mind that there is a $25 per bottle corkage fee to drink your own bottles in the dining room or any public spaces. Celebrity now offers a new restaurant venue carved out of the San Marco dining room that is exclusively dedicated to suite passengers and upper-tier loyalty program members. It has its own chef's team and serves breakfast, lunch and dinner. 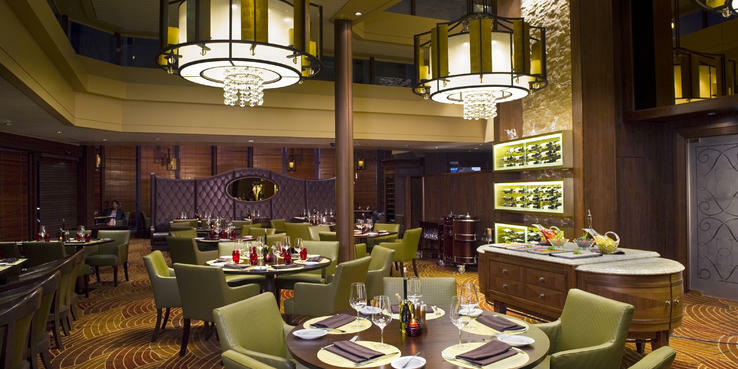 For a casual meal, head to the Oceanview Cafe, Constellation's buffet venue on Deck 10. The oval space feels a bit like a running track with various food stations positioned along and inside the loop. Seating is casual and pleasant with views of the ocean. It can get a bit crowded at peak times, but there are enough duplicate food stations so passengers never have to wait too long for chow. Breakfast offers a host of tasty and sometimes exotic items designed to satisfy Asian, English, Indian and American palates. Scrambled eggs are a favorite, fresh and never watery, though served from a steam-table tray. There's an omelet station where you can build your own or order eggs cooked your favorite way. Lunch and dinner are international feasts with offerings like pizza and pasta, sushi and Asian stir-fries and curries, and fish and chips and other English specialties. Plus, there are sandwich and salad bars, along with a Caesar salad station. Desert choices are many, ranging from mini-tarts and sugar-free puddings to warm cookies, ice cream and soft serve. Beverage servers bring beer or wine (for an extra fee) on request. The adjacent Sunset Bar, inspired by the richly lacquered cherry wood and khaki canvas sails of a classic schooner, provides alfresco seating on the stern for about 120 passengers. On sunny days, you'll find many diners there enjoying a quiet bite as they gaze at the ship's wake. From noon to 6 p.m., the Poolside Grill offers a standard menu of tasty burgers, bratwursts and grilled chicken, with a full range of complement toppings including crisp bacon, sauteed onions, sliced red onions, tomatoes, lettuce and pickles. Veggie and turkey burgers are also available upon request. Salads, like chickpea and feta or potato, round out the options. Constellation's upscale alternative restaurants are Qsine and Tuscan Grille, both open for dinner. Tuscan Grille is a modern Italian steakhouse. The Deck 11 circular space features dark-wood wine cabinets atop faux stone walls, and the restaurant is divided into two sections by a large leather banquette. The $45 ­per-head dinner is a multi-course affair. Favorites include the antipasti plate (with cheese, olives and marinated squash), fried calamari, bruschetta with tapenade and goat cheese, arugula salad with pine nuts and goat cheese, tender and juicy rib-eye steak with a pecorino mac 'n' cheese and meal-ending gelato. The steak portions are huge for most eaters, and the chef will reduce the portion as you request. Come hungry, otherwise you'll be stuffed when the dessert plate arrives. The Tuscan Grille is also open a few times per cruise on an irregular basis, usually on a sea day from noon to 1:30 p.m. The fee is $20 and the menu features items from the dinner menu including a pasta, steak and veal chops. Foodies, as well as those looking for an exclusive dining experience, should sign up for the little-publicized Chef's Table dinner, which features plentiful servings of some of the best food and wine on the ship. The availability of these dinners varies by cruise and passenger demand. Sometimes, they are mentioned in the daily newsletter; otherwise, it's best to inquire at reception. The fee tends to be pricier than similar offerings on other cruise lines; you'll need to inquire about the exact cost once onboard. If you're really into food and wine, you'll likely enjoy this three-hour-plus feast with great free-flowing super-premium wine and the opportunity to chat with other cruisers, senior officers and the executive chef. It's a meal to remember. The Blu restaurant is the sophisticated white-table-clothed dining venue touting "clean cuisine” and available only to AquaClass passengers. (Certain suite passengers can get a table, based on availability.) The dining spot is open for breakfast 7:30 a.m. to 9 a.m. and dinner 5:30 p.m. to 9 p.m. Although there's a preconception by many passengers that the menu is full of flavorless vegan-type dishes in small portions, the reality is that the chefs strive to prepare popular dishes that are palate pleasing and reasonably good for you. For instance, they serve a steak with tasty truffle vinaigrette instead of a rich caloric bearnaise sauce. Breakfast includes the standard comfort foods like pancakes, waffles and French toast as well as eggs cooked to order -- of course you can order yogurt and a fruit plate as well. A typical dinner menu would start with appetizers like braised beef short ribs with chive pancakes, crispy corn fritters or mussel ceviche followed by a soup or salad course of New England clam chowder, Caesar salad or Waldorf Salad. Entrees include manicotti stuffed with ground veal, chorizo and beef, roasted wild Cornish game hen, and prime rib. For health-conscious cruisers looking for some balance, Constellation has the AquaSpa Cafe, which is located within the glass­-and-steel-­covered solarium area and is very popular with the bathrobed gym-and-spa crowd for breakfast and lunch. The venue is a smallish stainless steel buffet lunch counter, featuring SPE-certified lighter fare, including low-calorie soups, low-fat entrees and sugar-free desserts formulated with no compromise in taste. Breakfast items include yogurts, fruit plates and whole-grained cereals. Grab­-and-­go items on offer include sushi (vegetable rolls), grilled chicken, poached shrimp with avocado slices, whole­grain breads, a salad with a selection of light vinaigrettes, a daily hot or cold soup (melon with ginger) and poached fruit bar. There is no cost for most items, although there is a fee for certain desserts and smoothies. The smell of chlorine hangs heavy at times in the misty air, so many diners opt to take their goodies out to the main pool area. AquaSpa Cafe hours are 7 a.m. to 10 a.m. and from noon to 2 p.m.
Sushi on Five, the a la carte sushi bar hidden away on Deck 5, is the spot to grab a roll or Asian entree for lunch or dinner. If you're a Starbucks fan, you'll love Cafe al Bacio and the Gelateria located on Deck 5. Coffee drink prices at Cafe al Bacio are around $4 for a cappuccino and other specialty coffees, but you can fill up free on the delicious assorted pastries, mini-sandwiches, cookies and cakes only available here. It's open from 6:30 a.m. until midnight. Passengers eagerly await servings of some of the best desserts onboard, including the lemon tart, cheesecake and the cream-layered coconut cake. During lunch hours, there are savory options like small ham and turkey sandwiches and salmon mousse tarts. Adjacent high-backed chairs with porthole ocean views are much in demand by cruisers looking to relax with a coffee and book. Across the way at the Gelateria, gelato costs $3 for a single scoop and $4 for a double. (Sprinkles, crushed nuts, M&M's and other toppings are included in the cost.) There is a free ice cream station in the Oceanview Cafe, but their not-so-creamy offerings paled to the gelato here. Room service is available 24 hours a day. You can order items, including a tomato, cheese and avocado quesadilla or a turkey club, using the interactive TV. Between 11 p.m. and 6 a.m., there's a $3.95 charge for passengers in interior, oceanview and balcony staterooms. Breakfast can be ordered in advance via a door-hung ticket or the interactive TV the day before.